Grab the code and share the love! Sometimes it is necessary to cover up good stuff when art journaling. In creating layers, I will often cover up elements that I really like. I don't worry about "ruining" my page or not liking the end result. The freedom I give myself to cover up things makes the process more enjoyable and more often than not I end up more pleased with the results. Give yourself permission this week to cover up some good stuff and see what happens! My first layer is an inky piece of newsprint that I glued to my page. I used the Stones Divided stencil with molding paste to create the half circle shapes. I outlined them with a black stabilo pencil and added water with a water brush to spread the color. I also painted an oval shape with watered down black gesso. Next, I added some white circles with a Sharpie Poster Paint Pen to the black oval and used a handmade mark making tool and white acrylic paint to create the rings. I journaled at the bottom of the page with a black pen (this is the good stuff I plan to cover up)! To finish my page, I stitched a tag and other elements to an inky piece of paper, added a circle sticker, stamped a feather from Rae Missigman's Natural Elements rubber stamp set to book paper, trimmed and stitched to the top. I stitched a scrap piece of paper and glued it to the top of the black painted oval. Our Blogs: Lorraine Bell, Rae Missigman and Sandi Keene. Thanks for your comment! Unfortunately, spammers have made it necessary for me to approve your comment before it appears! ©2004-2014 by Roben-Marie Smith. 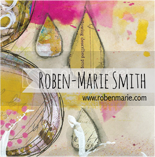 The contents of this website, including text, photos, and artwork are the creative and intellectual property of Roben-marie Smith, unless otherwise indicated. No portion of Roben-Marie's works or writings may be copied, reproduced in any way, or downloaded without prior granted permission. Please feel free to link to this site.